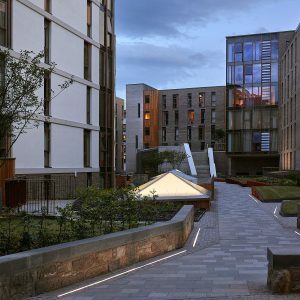 HarrisonStevens: The Holyrood North project is a unique placemaking and regeneration project imbedded into the historic city grain, while accommodating and responding to contemporary life. 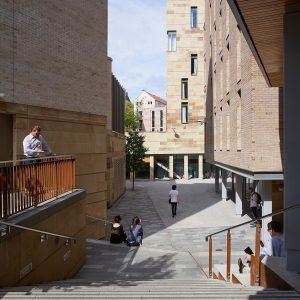 The Holyrood North Project was developed to meet an unprecedented demand for postgraduate and overseas students travelling to study at the University of Edinburgh. 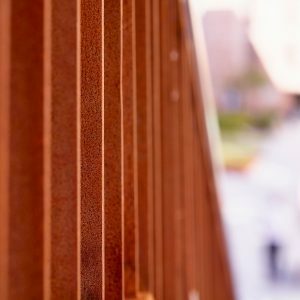 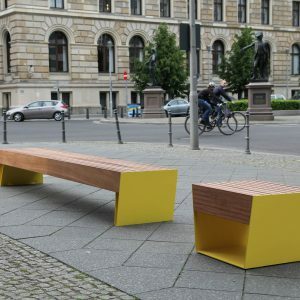 This demand was conceived to be met through a unique, locally sensitive and historically contextual response that is of global significance. 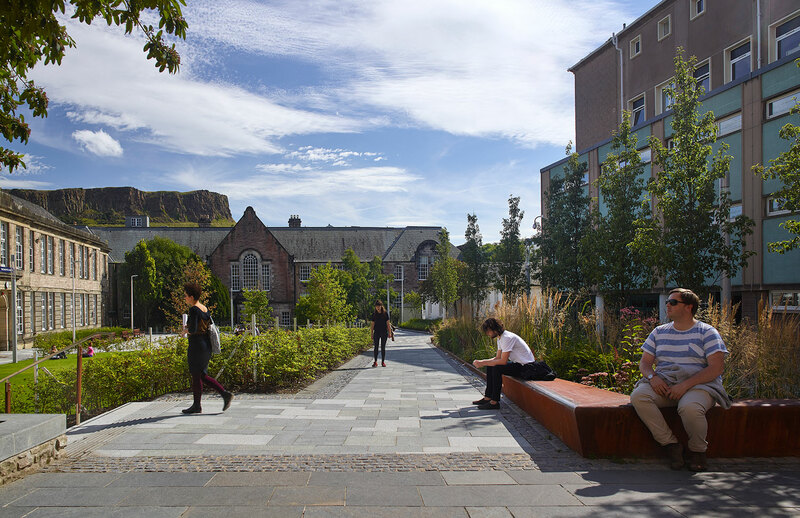 Within an UNESCO world heritage site, the old town of Edinburgh is an iconic city scape. 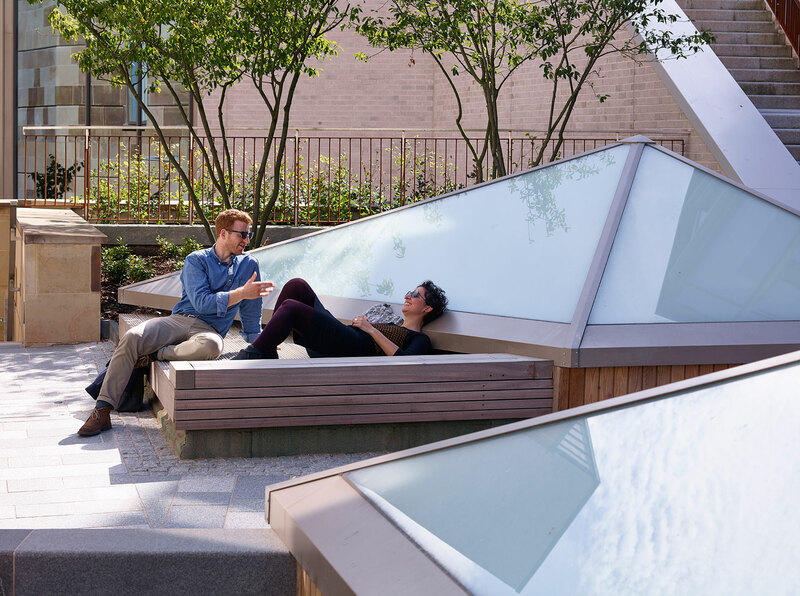 Natural light is a valuable design component in such a dense urban environment. 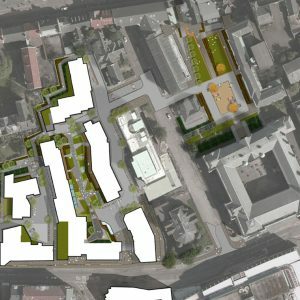 The relationship between light and dark through confined and open space within the old town is a key contributor to the spatial quality that the developed urban form draws on. 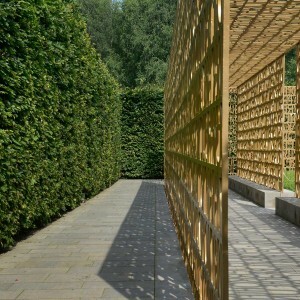 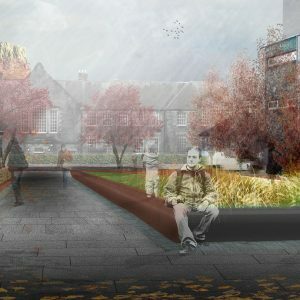 The public realm in turn responds to this climate, aspect and colour through appropriate form, materiality and planting. 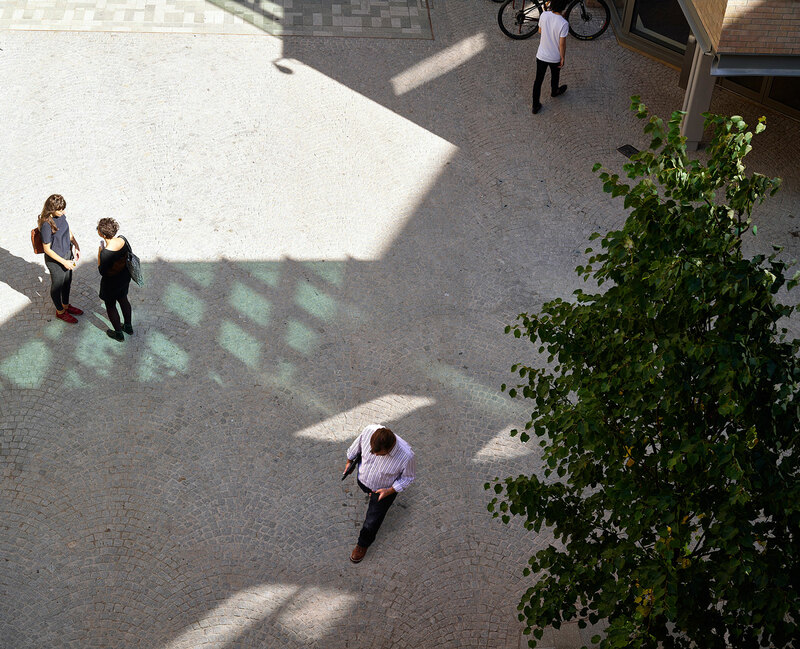 The light enhances the sense of anticipation, drawing people into spaces & down closes. 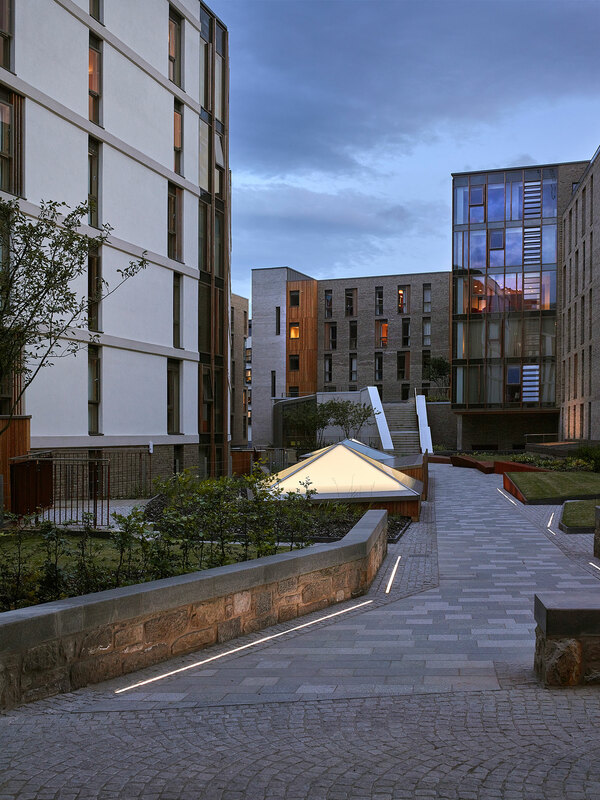 This contrast of scale and unexpected light enlightens our experience of the old town and this development in equal measure. 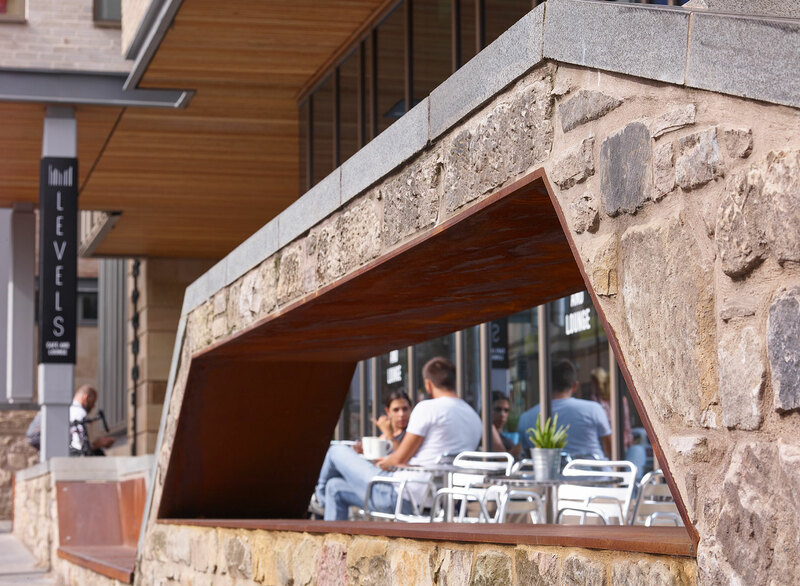 The constant reference of glimpse views between buildings towards familiar Edinburgh landmarks, the Salisbury Crags or the original historic built form, provide constant reminders and comfort of context and orientation. 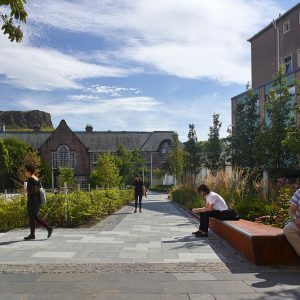 Taking inspiration from the adjacent volcanic landscape of Arthur’s Seat and Salisbury Crags, the palette of materials, both underfoot and on buildings, is informed by both the immediate context and the desire to create this unique new urban landscape. 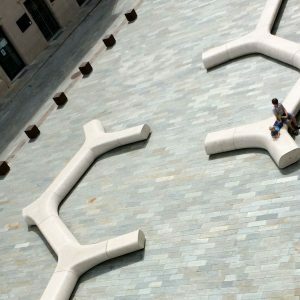 A unifying concept of geology and geomorphology is played out across various public realm elements giving the site its own identity within the wider Old Town context. 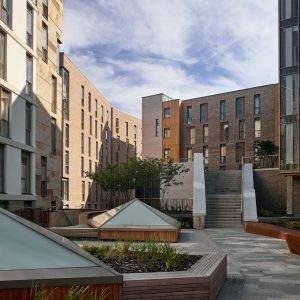 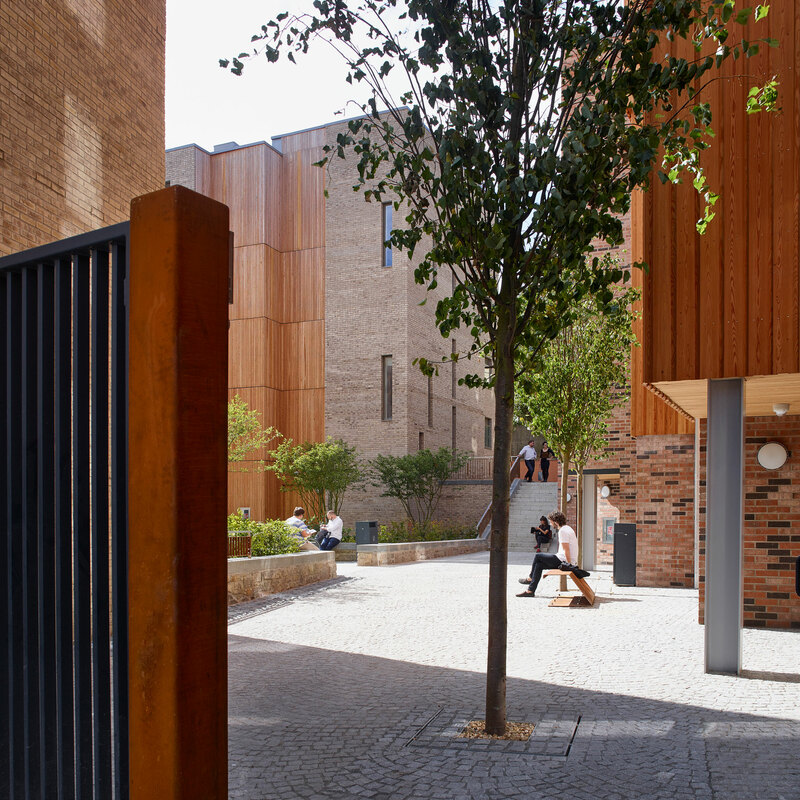 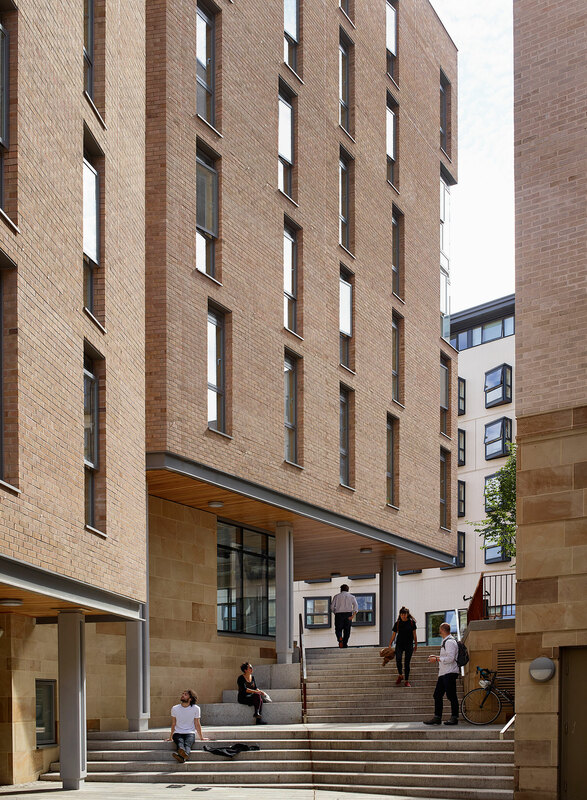 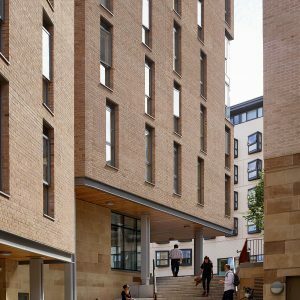 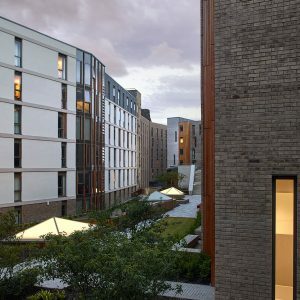 The campus was a ‘brownfield’ site, an impenetrable city quarter that this project has punctuated by a multitude of routes, views and permeability from the Royal Mile to Holyrood Road. 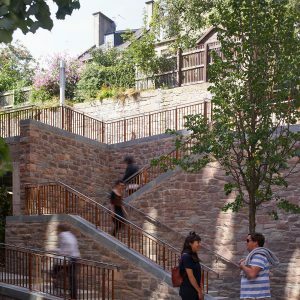 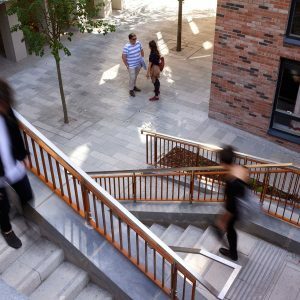 The steeply sloping site, dropping over 2 storey’s across a city block demanded an intricate weave of spaces, pedestrian routes along with entry thresholds, delivery & maintenance access. 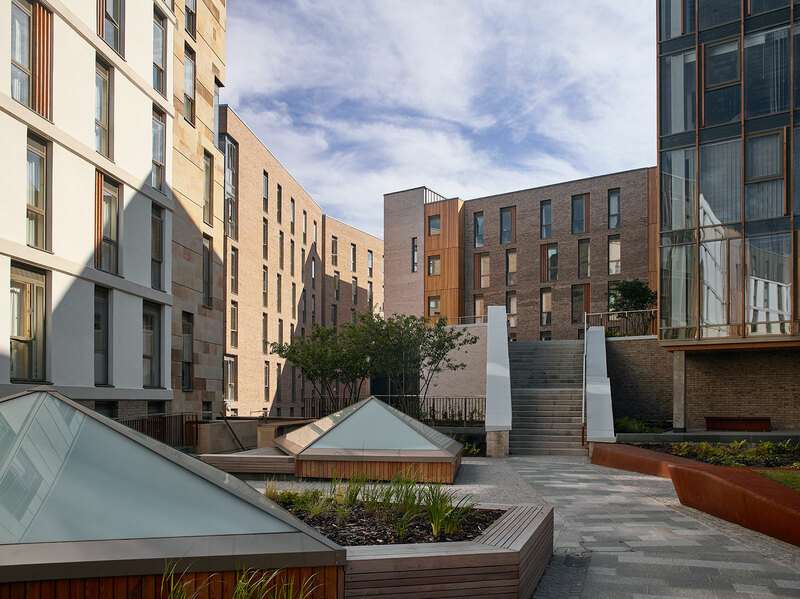 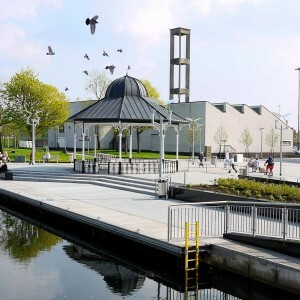 The adjacent communities and ongoing development both north and south of the site now traverse through the completed high-quality public realm. 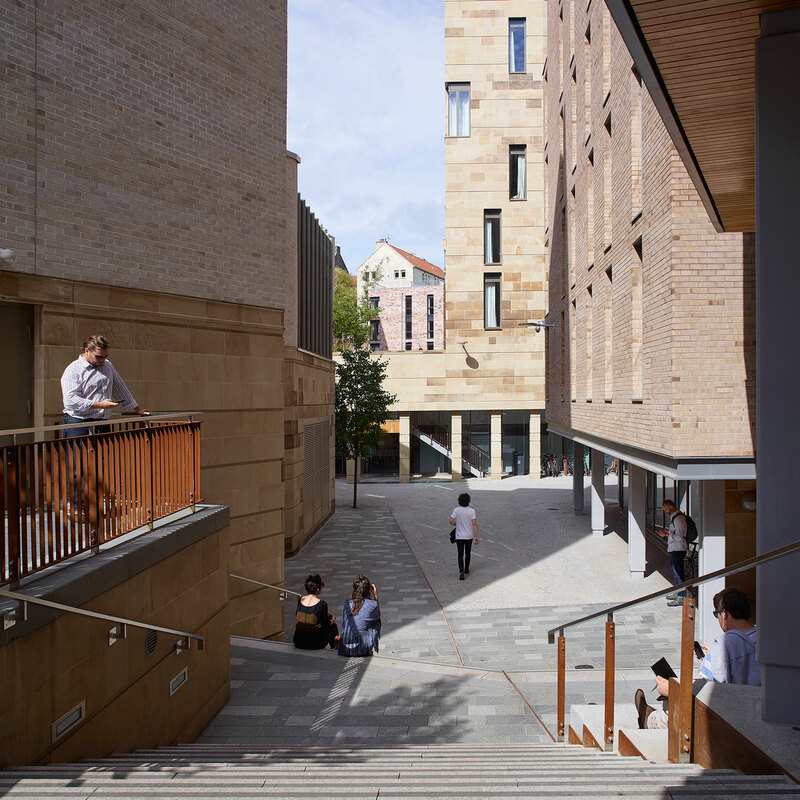 This characteristically tight grain and steeply stepped site of the old town did significantly challenge the external environments’ ability to deliver a modern student facility. 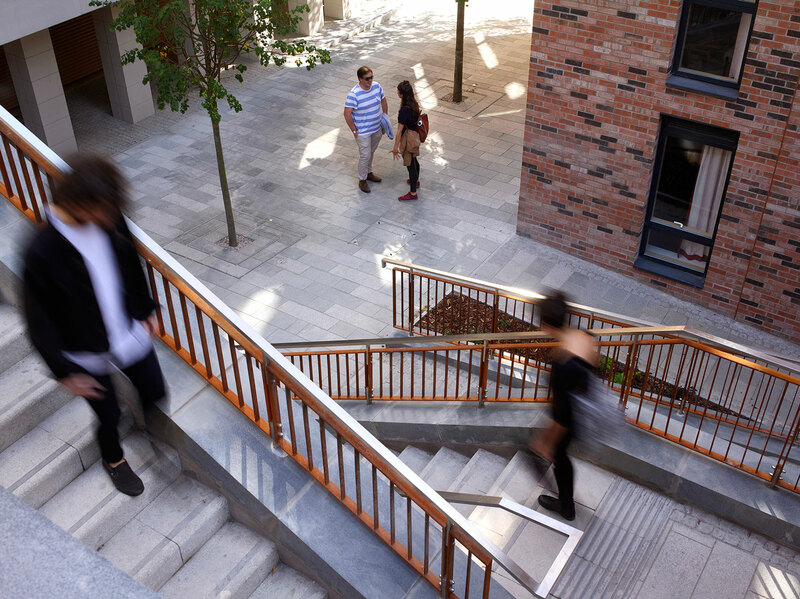 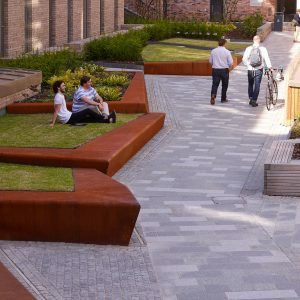 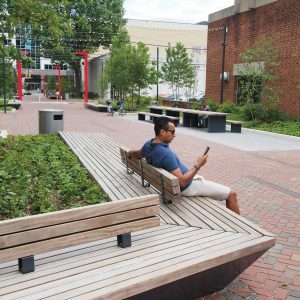 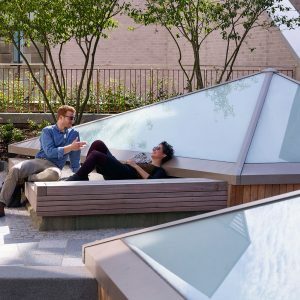 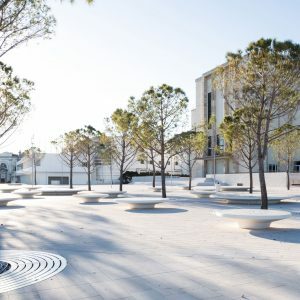 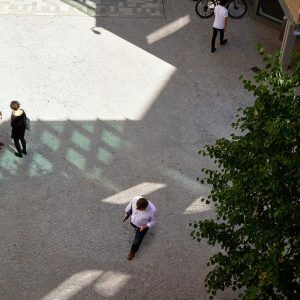 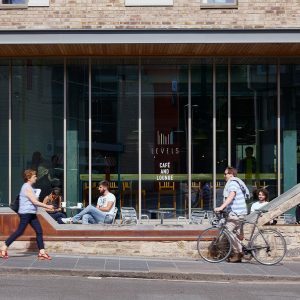 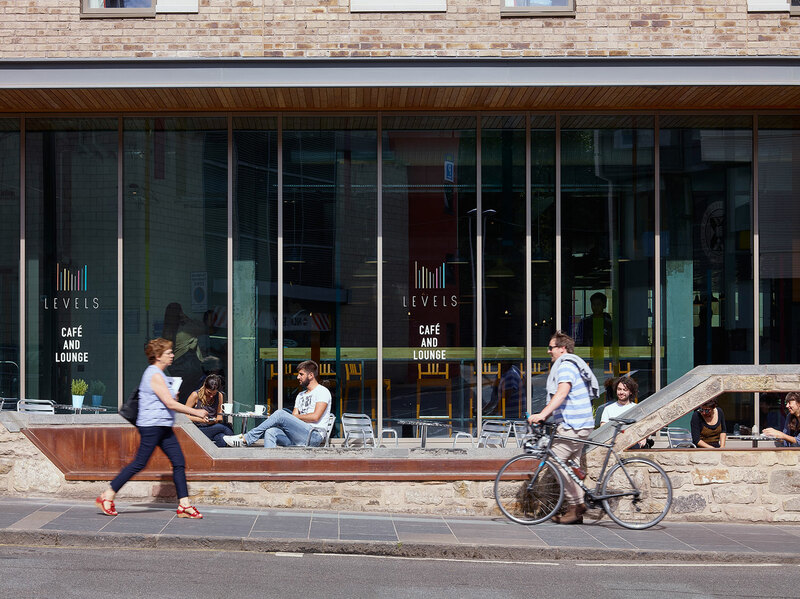 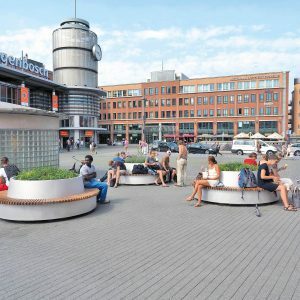 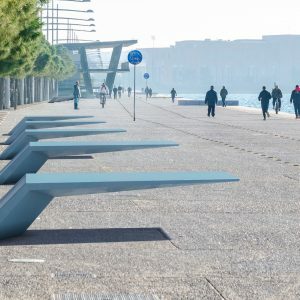 The design solutions capitalised by delivering a slow-flow, shared surface, and public realm that maximises use and integrated facilities to reduce clutter. 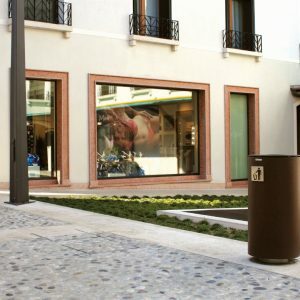 Furniture is kept to a minimum, and waste collection facilitated by subterranean or internal stores to prevent the street level proliferation of wheelie-bins. 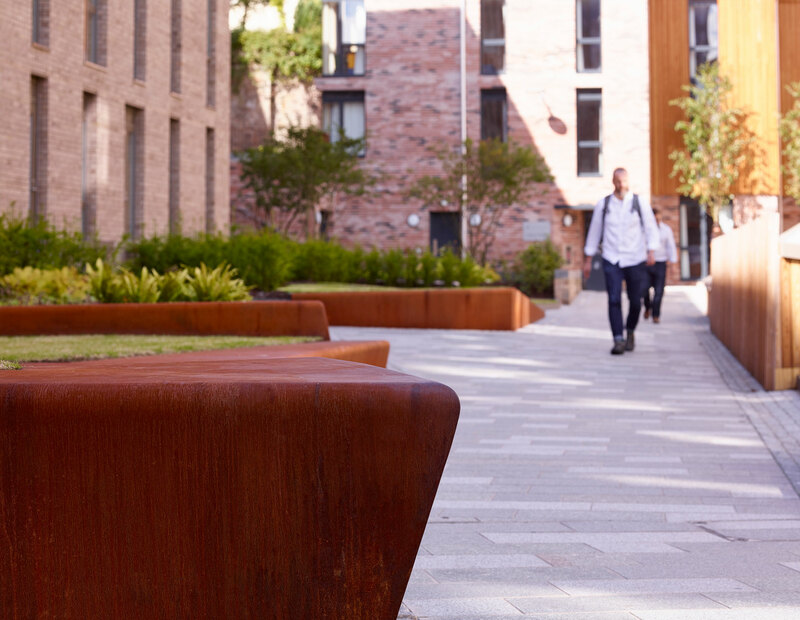 Within the public realm and wider shared surface spaces, life-cycle costing was a critical influence on the robust detailing, pragmatic design solutions and material choices. 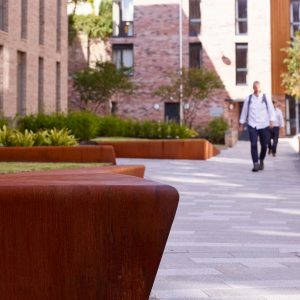 The core concept has guided the material choices and detailing set to be tested by intensive use over a challenging terrain. 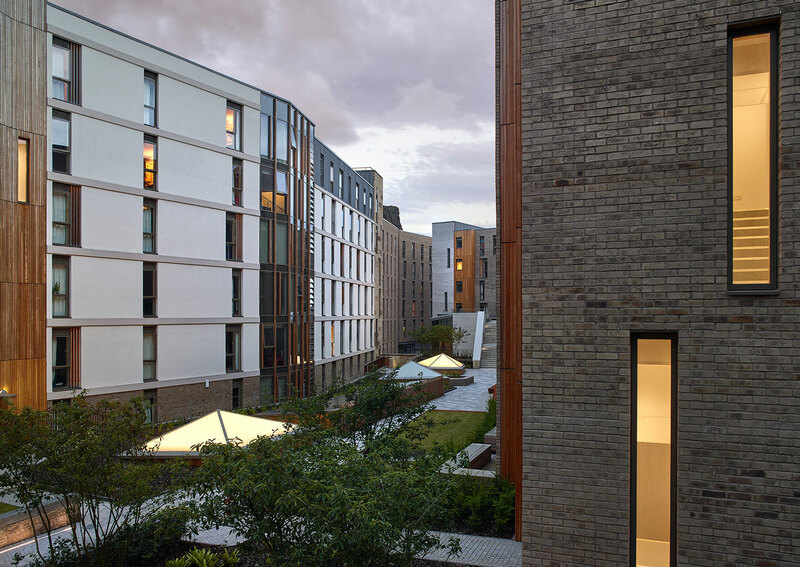 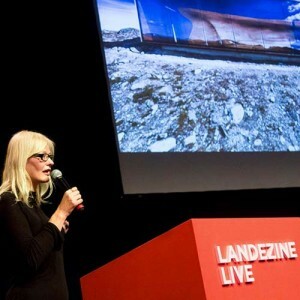 The integrated design of large level changes has amplified the need for efficient use of resources. 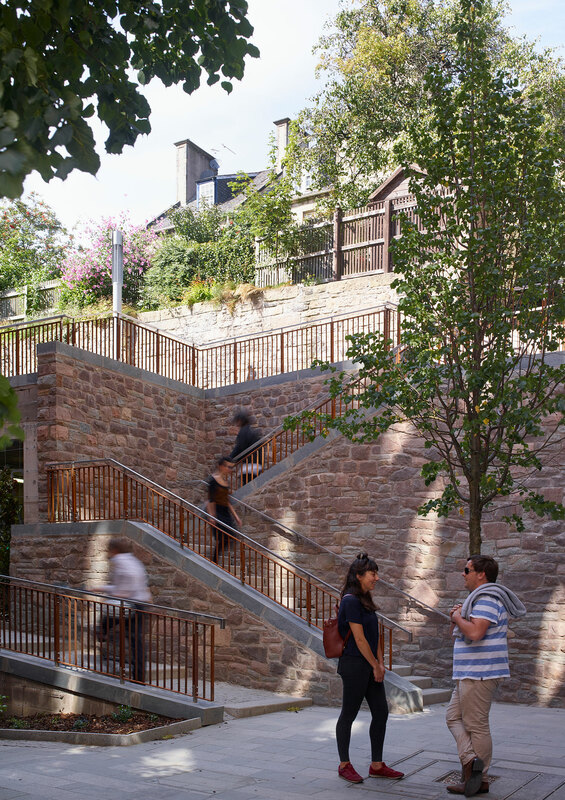 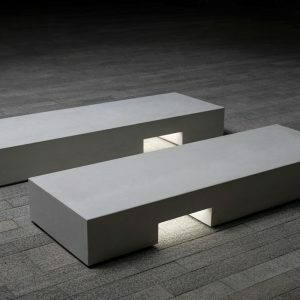 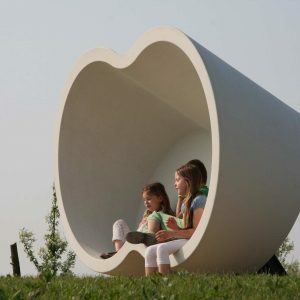 Where walls are needed, to facilitate level changes, they are programmed to include a seating element, where steps traverse a route, they are appropriately scaled to support incidental seating and congregation, affording a sunny aspect or an inspiring glimpsed view through the urban form. 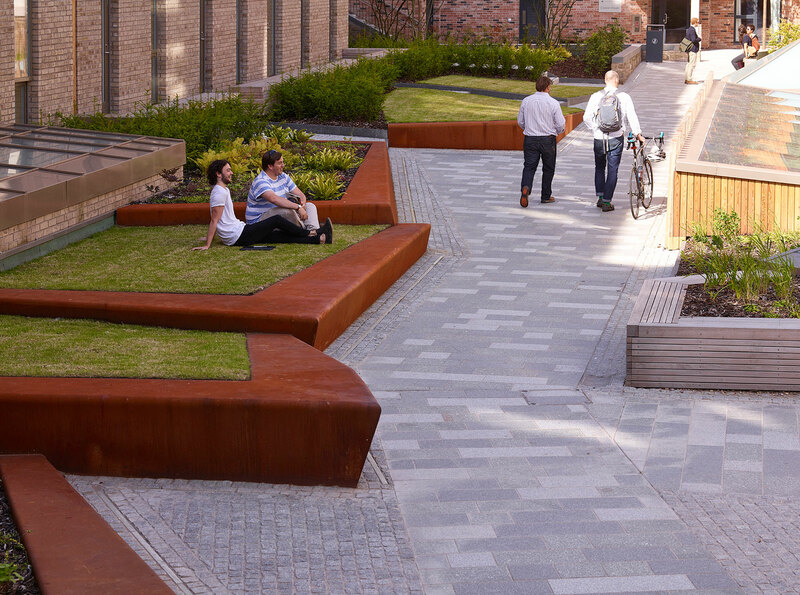 The re-use of site-won materials for the significant public realm walling was a key consideration identified early in the scheme. 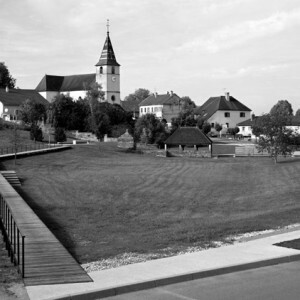 The down takings where subsequently carefully removed from site and stored. 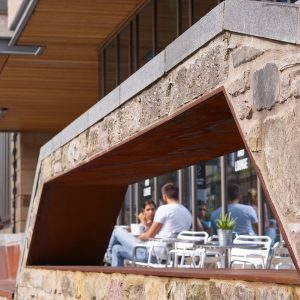 Working with a local stone mason it re-purposed to provide the supporting context to the paving and other external elements and celebrated at the front of the site with the contemporary interpretation of the boundary walling to Holyrood Road. 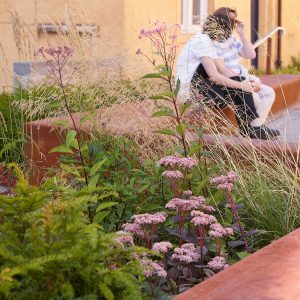 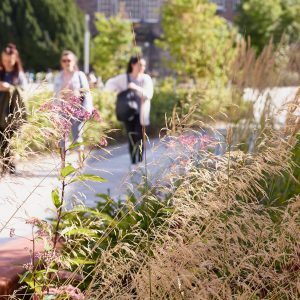 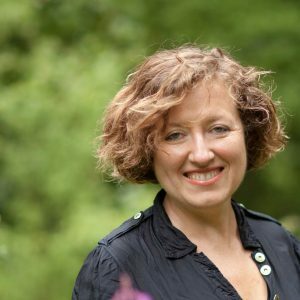 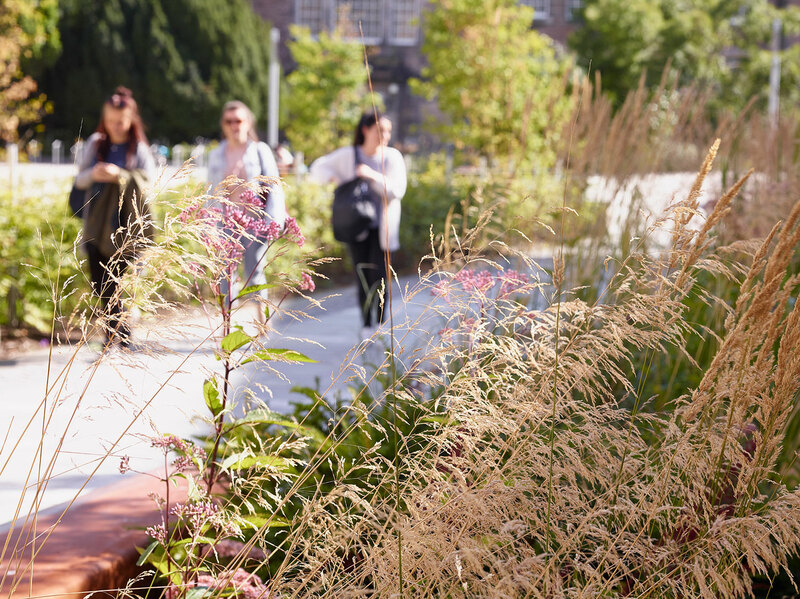 Our design ecologist was extensively consulted to ensure local biodiversity target species were effectively provided for, to increase the ecological benefit to the urban context. Furthermore, the onward maintenance burden of the planted landscape is considered with a passive irrigation system allowing hard surface run-off to be captured in artificial aquifers to then be reused by adjacent planting beds and soil volumes. 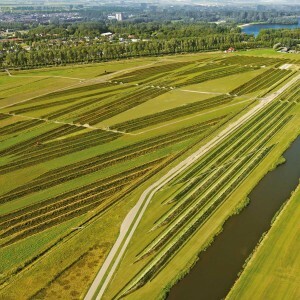 These plantings are confined and not forced into areas that will have restricted light / rainfall. 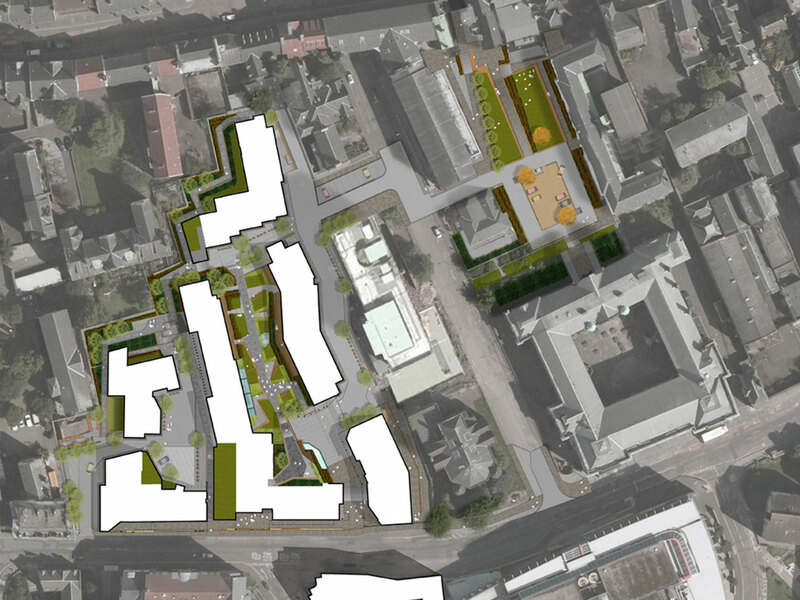 Extensive green roof systems integrate the habitat networks across the site.